Every month I try to host a happy hour at my studio. I like to use this time to showcase new recipes and design ideas as well as just get together with new and old friends. I always have a signature cocktail or two at these events and they are always a hit. Last month the happy hour fell on St. Patrick’s Day and the signature cocktail was my Irish Whiskey Mojito. This cocktail was the biggest hit to date, everyone loved it. It’s refreshing and crisp and yet still has a kick. It was a great cocktail for St. Patrick’s Day but it will be just as good this summer while sitting out on the patio. 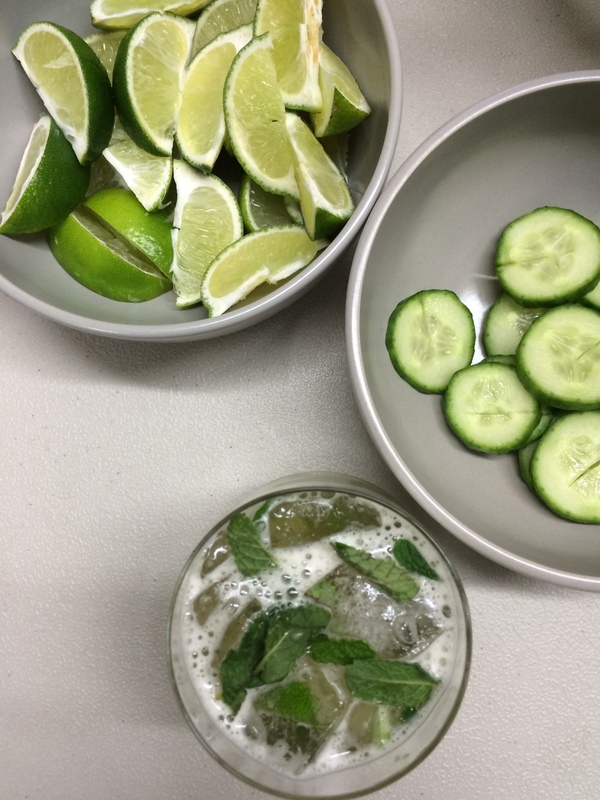 Make an Irish Whiskey Mojito tonight you won’t be disappointed! This Irish Whiskey Mojito is refreshing and crisp and yet still has a kick. In shaker place all the ingredients and the glass full of ice. Shake vigorously! Doing this will muddle the lime, cucumber and mint! Pour everything back into the glass and top off with more ice. Garnish with a wedge of lime and a slice of cucumber.